The election process is now complete for the TAB terms starting January 1, 2019. Voting was not necessary because only one nomination was received for each open seat (i.e. all the individuals nominated automatically won their seats). 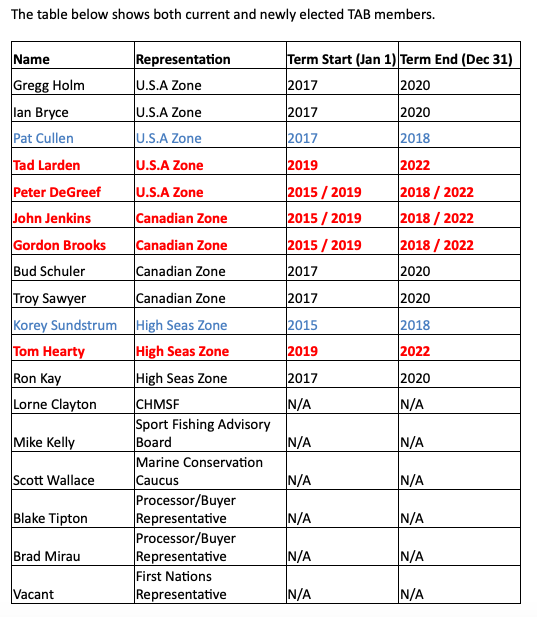 The results are that J. Jenkins, P. DeGreef, G. Brooks will continue to 2022; Pat Cullen and Korey Sundstrum will end their terms on Dec 31; Tom Hearty and Tad Larden will begin on Jan 1. The table below shows both current and newly elected TAB members.